Does an instant pot work well as a slow cooker? The answer is yes. If you buy the right instant pot with slow cooking function, you can achieve the quality of food prepared on slow cookers using your instant pot. Other functions which an instant pot can perform include pressure cook, salute among other functions. You can use your instant cooker as a slow cooker hence saves on cost. It is not a must for you to buy a slow cooker if you can have an instant pot which has the functions of slow cooking. Not all instant pots have multifunction. 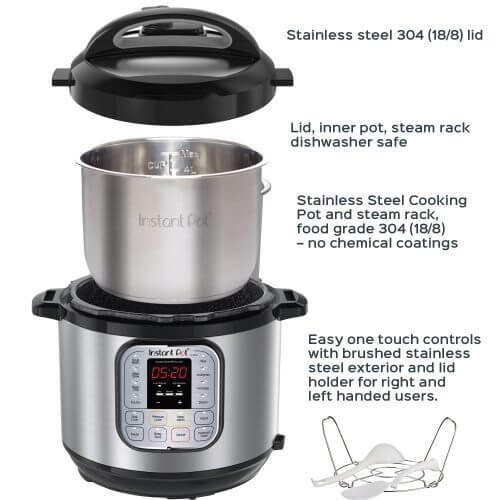 It is essential for you to check the features available on your instant cooker before you proceed to order. It is the process where food is cooked at a slow rate. Low temperature used to cook the food will require you to take several hours before the food can cook. Some of the foods which you can cook at slow rates include stews. Remember when making stew you will be required to cook food at a slow pace so that the hard texture of the food can soften for the perfect stew. The perfect foods to cook in a slow cooker include a hardened meat. They soften and release the fluids which make the perfect stew you can eat with different types of foods. You should avoid cooking vegetables in slow cookers because they tend to overcook and lose the nutritional value. The long cooking processes denature the enzymes which makes the vegetable less efficient in equipping your body with the necessary nutriments. The foods cooked using a slow process has great taste. Many people prefer them during cold seasons. Easy to use: The instant pots available in the market have functions you will just select by a push on the button. You do not have to carry several utensils around so that you can cook different types of foods. The instant pot has several functions which will only require you to choose the right procedure and get your food cooked. Easy to monitor internal temperatures: When slow cooking, you will be required to monitor the internal temperature as per your recipe requirements. The modern instant pots available in the market make it easy for you to monitor the internal temperature. You will always cook the best food after you decide to use the instant pots. The pot has automatic sensors which allow you to control the temperature and the pressure in the pot. It is also effective in putting all conditions at optimum so that you can achieve the best results out of your slow cooking process within a short period. Saves energy: Slow cooking processes tend to consume a lot of power. But, modern instant pots are manufactured in such a way they help in conserving the energy. They speed up the cooking process while retaining the taste of the food. If you are looking for ways you can save energy, then you need to buy an instant pot which has several functions and apply it as a slow cooker.